Happy New Year and welcome to our new blog on all things sparkly and shiny. Its snowing here at Little Bo's Base Camp, so we hope you are all keeping nice and warm. To make your winter clothing just a little more sparkly, try adding a gorgeous dress brooch to to add a touch of glamour to your winter coat, use it as a scarf pin or even add it to your wooly hat. 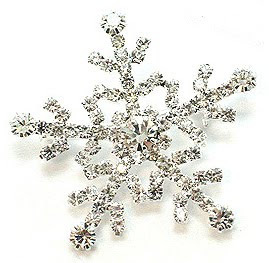 How about this lovely snowflake brooch now back in stock.